SMS Reminders & text alerts. Reduce no shows and missed appointments using text message reminders. Improve business efficiency, profits & service. Reduce no shows and missed appointments by reminding your customers, clients and personnel about upcoming meetings and appointments with SMS alerts. Automate your appointment confirmations and reminders improving business efficiency and reducing costs inflicted by missed appointments. 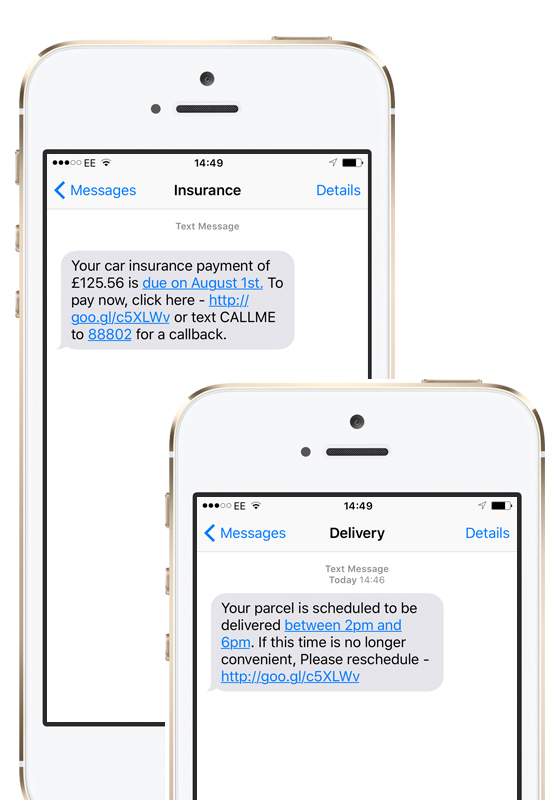 A text message or Voice Broadcast can take just seconds and pennies to send and can go a long way in showcasing appreciation of your customers business by sending them confirmation, a delivery reminder or them letting them know when a payment is overdue. Enable your customers to reply to your text messages and receive confirmations, reschedule messages and create an appointment system that is adaptable and convenient. Let customers confirm, cancel and reschedule by replying directly to your texts message using a virtual mobile number or a short code. Good communication plays a pivotal role in all relationships. SMS and Voice can be easily integrated with your existing systems to automate reminders to help your customers and staff remember so that you don't have to.
" 43% of millenials want to receive SMS alerts and reminders from brands and businesses"
67% of consumers want to receive reminders and alerts from their banks regarding balances and payments. 70% of consumers have found push notifications, out-of-stock reminders and order updates to be valuable.